(Washington, DC) – Judicial Watch today, as part of its ongoing Election Integrity Project, announced that Judicial Watch volunteer poll observers will monitor polling sites in Virginia on Election Day. 1,046 aliens, or residents who are not U.S. citizens, were on the voter rolls in 8 Virginia counties. If that rate of non-citizen registration held in the rest of Virginia’s counties, that would mean that about 6,500 non-citizens are registered to vote in Virginia. “In the 8 jurisdictions that provided us with lists of aliens recently removed from their voter rolls, we discovered that 31 non-citizens had cast a total of 186 votes between 2005 and 2015. The most alien votes were cast in 2012 followed by 2008, the year President Obama was elected to his first term.” There are 133 total Virginia voting jurisdictions, so the number in this report represents a mere fraction of the true total of illegal votes. 19 deceased individuals recently re-registered to vote in Virginia. In 2013, the Interstate Voter Registration Crosscheck Program (Crosscheck), which provides a lists of voters who are registered in more than one of the 26 states participating in the program, revealed that 57,923 Virginia voters were registered to vote in at least one other state. Of course this number would be much higher if the Crosscheck program included every state – including New York, California, and Texas, the most populous states in the country. 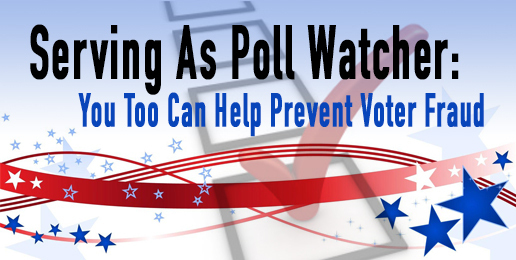 Judicial Watch’s Election Integrity Project leader, Robert Popper, will train Virginia’s poll watchers. He is a former deputy chief of the Voting Section, in the Civil Rights Division of the Department of Justice and a veteran poll observer for the Department of Justice. Judicial Watch’s Election Integrity project began in February 2012. Since that time Judicial Watch has put several state and county officials on notice when they are in violation of federal laws requiring them to clean up their voter rolls. Judicial Watch has also participated in lawsuits defending photo ID and other commonsense election integrity measures. Judicial Watch has also filed successful lawsuits in states like Ohio and Indiana that resulted in cleaner voter rolls and have achieved victories in the United States Supreme Court to stop race-based elections in Hawaii. Judicial Watch has fought federal electoral laws that have the effect of making it easier for non-citizens to register to vote, and harder to remove them once they are registered. And Judicial Watch has conducted election monitoring before, for example in New Hampshire in 2014. “Judicial Watch will monitor voting places in Virginia to expose and deter any voter fraud,” said Judicial Watch President Tom Fitton.